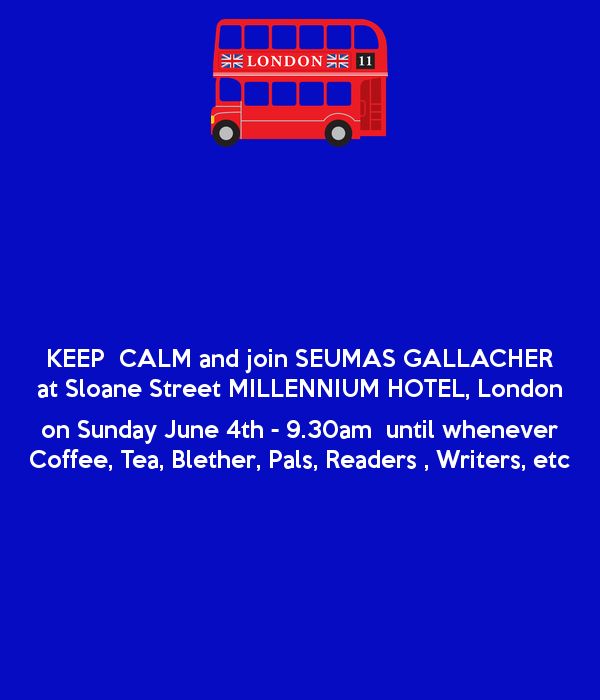 ..what?… get together with authors, readers, bloggers, pals… where?… Sloane street MILLENNIUM HOTEL, London… when ?… Sunday, June 4th… time?… 9.30am until whenever… coffee, tea, G and Ts (? ), blether, and anything else emb’dy can think of?… also joining us …fellow crime thriller scribblers , Eric J Gates and David P. Perlmutter… see yeez later… LUV YEEZ! ALL MY BLOG POSTS ARE FREE TO SHARE OR RE-BLOG SHOULD YOU SO WISH—BE MY GUEST! So sorry to miss it (I’m in Spain at the moment) but I’m sure it will be great. Looking forward to your chronicle of the day! I would but I’m already booked for the Bloggers Bash in London the followig weekend, Seumas! Have fun.